Bedlam Theatre Company has become famous performing dazzlingly minimalist reinterpretations of classics from such authors as Shakespeare, Shaw and Jane Austen. Now they have attempted their first musical, New York Animals, a world premiere play by Steven Sater (Spring Awakening) and with lyrics by Sater and music by Burt Bacharach, his first theater score since 1968’s Promises Promises. While the production by Bedlam’s artistic director Eric Tucker is cool, crisp and clean, New York Animals is ultimately disappointing, feeling like less than the sum of its parts. The new musical is similar to Sater’s Spring Awakening in that it takes a group of people in a specific historic time and place (here New York, circa 1995) and adds music between the scenes which is in a different style from the play. It also resembles Bacharach’s Promises Promises in depicting a series of New York types at work and play. While the Bacharach/Sater score is sumptuously sung by an on-stage band of five led by impressive lead vocalist Jo Lampert, Sater’s book in which we meet various Manhattan denizens whose lives intersect in the course of one day feels dated in that we have met these people before and the problems of the characters seem trivial compared to the problems of today. 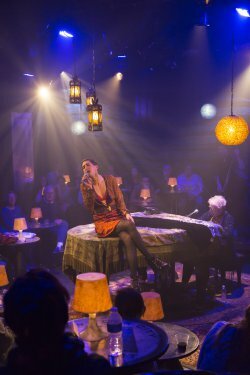 In the form of what used to be called a cabaret musical, New York Animals takes place in set designer John McDermott’s newly created jazz nightclub at the New Ohio Space in which the audience sits at small café tables and are offered refreshments by the usher waitresses. The cast and band gather around a grand piano at which sits music director Debra Barsha. 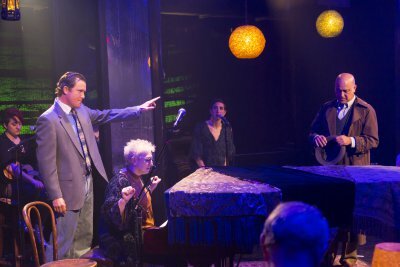 The five-member band is introduced as the “New York Animals.” The book scenes also take place all around the venue, in the audience among the tables, as well as around the piano. The dramatic cast includes three Bedlam regulars (Susannah Millonzi, Edmund Lewis and Tucker) as well as two talented additional members (Blanca Camacho and Ramsey Faragallah.) With costuming by Nikki Delhomme, they play 21 characters, brilliantly differentiated, demonstrating their versatility. The story begins on a rainy day in late fall in the morning and continues until 3:30 AM that night. The sites we visit around New York include a NYC taxi on the way to the Guggenheim Museum, the home of a distraught housewife whose new baby is ill, the office of a wheeler-dealer businessman in the garment district, a spectacular Park Avenue apartment, an upper West Side studio apartment in a brownstone. Scenes in public places like a line for a multiplex movie theater, an East Village coffee shop and the emergency room at St. Vincent’s Hospital bring together many of the characters. Among the dramatis personae are Roxanne, a self-entitled Park Avenue matron screaming on the phone to her grocer that she has not received her parsnips (Camacho); Mr. Earl, an introverted obsessive-compulsive who has had the same chicken dinner for 13 years (Faragallah), Ed, a homeless man dying from TB (Lewis), Leonard, a college-trained taxi driver with conspiracy theories and an unfinished book (Tucker) and Lisa, a young woman so depressed over her mother’s suicide that she can’t get out of bed or leave the house (Millonzi). Among NYC ethnic types are Consuelo, the expansive Hispanic maid with a broad accent (Lewis); Sylvie, a talkative Eastern European waitress (Camacho); and Garcia, a Brooklyn-born Latino who doesn’t know any Spanish (Tucker). Like Schnitzler’s 19th century play, La Ronde, many of the scenes carry over one character to the next, although other characters encounter each other in the course of the evening. These are all people seemingly on the fringes of society, the disaffected, the disenfranchised, the dissatisfied and the desperate. All seem to want something they are not able to have in the end. In the final scene, the homeless man quotes E. M. Foster’s iconic phrase, “Only Connect,” but New York Animals suggests that in the Manhattan of 1995 that was not possible. Despite the familiarity of the sketches and vignettes, the cast is excellent. Millonzi might have the edge playing five very different women in their 20’s, but all of the actors create memorable personalities. The seven splendid new songs by Bacharach and Sater are blues and torch numbers, a distinctive departure for the composer, though occasionally a bar from “I’ll Never Fall in Love Again” seems to have made its way into the score. Sater’s lyrics have very intricate rhyme patterns as they speak of life in New York, as well as heartbreak and disappointment of various kinds. The most impressive performance of the evening is that of vocalist Jo Lampert whose throaty singing can break your heart and who is worth the price of admission. It is saying a good deal that the musical portions of New York Animals could easily be performed as a unified cabaret without the book scenes. New York Animals, the second New York musical by two-time Tony Award-winning Steven Sater and the second stage score from six-time Grammy and three-time Academy Award winner Burt Bacharach, is an ambitious show. The Bedlam production by artistic director Eric Tucker is always engrossing. Unfortunately, the total product is an uneven blend of wonderful songs and minor dramatic scenes which attempt to create a portrait of a city that is long gone without having anything profound to say about the lives of its inhabitants.